Have that feeling that something is wrong at your hotel but do not exactly know where to begin? The Wake Up Call Report can put those feelings to rest. This comprehensive report tells you what you want to know about your hotel and is tailored to your specifications to address your concerns. It is performed by the principals of Hotel Source, Inc., who are experienced hotel owners, advisors and real estate brokers. Now is not the time to let money walk out the door. 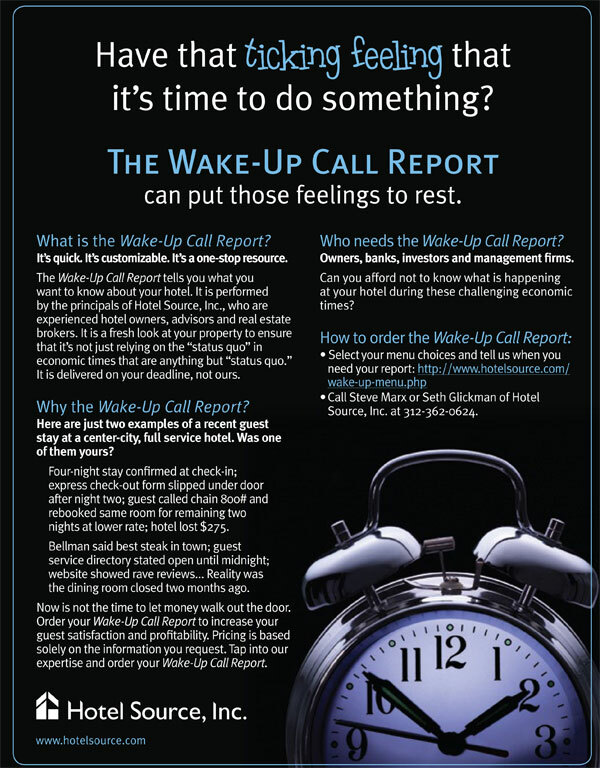 Order your Wake Up Call Report to increase your guest satisfaction and profitability. Pricing is based solely on the information you request. The Wake Up Call Report is delivered on your deadline, not ours. We'll spend the night at your hotel and let you know how your guests are treated.